Apache Camel - Hippo Event Bus Support component provides proper solutions for the architectural needs where you should update data in the external system on document events (such as publication/depublication) in Hippo CMS system. The most popular scenario is integrating with the existing Enterprise Search Engine. Hippo CMS is required to update search index data based on document publication/depublication events mostly, as shown in the diagram below. 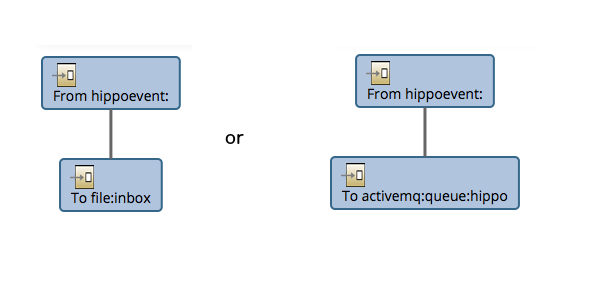 If you implement an event listener registered to Hippo Event Bus, then it should look like almost the same as the diagram shown above. The event listener can probably invoke the external search engine (e.g, through either REST service or direct API call) directly in this approach. If the external system becomes unavailable at some moment for some reasons, then it may lose the event messages. How can we guarantee all the events processed? Reliability matters. If invocations on the external search engine may take longer than expected at some moment for some reasons, then it may affect the performance (e.g, response time) in the CMS Frontend Application and the user experiences. How can we avoid this? Performance matters. We would like to monitor the event processing and be able to manage it (e.g, turning it on/off). If we implement event listener Java code ourselves for the features, then it would increase complexity a lot. How can we achieve that? Manageability matters. Apache Camel - Hippo Event Bus Support component is now provided to answer all those questions properly. The first demo shows integration with an Apache Solr search engine. The second demo shows the same integration approach as the first scenario, but with ElasticSearch engine instead of Apache Solr search engine. The third demo shows integration with either Apache Solr or ElasticSearch engine with using ActiveMQ as message queueing solution instead of file-based inbox folder polling. Basically solutions are really simple thanks to Apache Camel and hippoevent: Apache Camel component. one for storing HippoEventBus event into either a file in the designated folder or a message in the designated message queue. 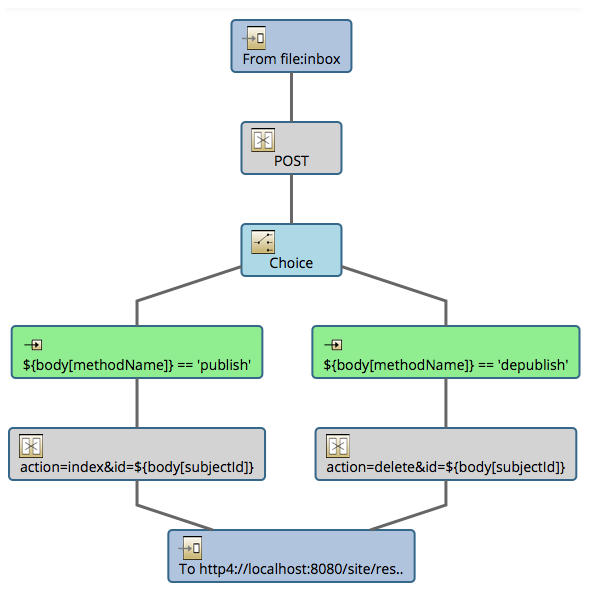 the other for invoking the specified REST service URL based on the (file or message queue) message. Depending on the real use cases, you can configure more advanced complex routes (such as parallel, translation, etc), but the fundamental idea here is 'store first and forward later'. In the first route (either 'Route-HippoEventBus-to-File' or 'Route-HippoEventBus-to-Queue' in this demo project), hippoevent: component receives HippoEventBus event and converts it into a JSONObject. And, the next component (either 'file:' or 'activemq:' component in this demo project) in the route stores the JSON message into either file inbox folder or designated message queue. Note: With the default running mode, the first component simply stores a Hippo Event into a JSON file in 'inbox' file folder. With ActiveMQ running mode, the first stores a Hippo Event into a JSON message in 'hippo' message queue instead. In the second route (either 'Route-File-to-REST' or 'REST-Queue-to-REST' in this demo project), a Camel component either polls a file from the inbox folder or receives a message from the designated message queue. And, the next component ('http4:' in this demo project) makes an HTTP request to the designated REST service URL in order to either index a document or delete a document in the external search engine. Note: With ActiveMQ running mode, the first component is replaced by 'from:activemq:hippo' in order to receive event messages from a message queue named 'hippo' in this demo project. Reliability: even if the external system becomes unavailable at some moment for some reasons, you don't lose any event message because all the failed messages are stored under either the designated folder or the designated message queue. Performance: by separating the process to multiple routes (store first and forward later), you can let the second route poll or receive the message and process asynchronously). This approach minimizes the impact on Hippo CMS/Repository performance. Modifiability: all the event processing is basically configured and executed by Apache Camel Context. You can configure any enterprise message integration patterns by leveraging various Apache Camel components. You can focus on your business logic. In this demo project, it is either SolrRestUpdateResource or ElasticSearchRestUpdateResource (each of which is implemented as HST REST service to create a SITE link and invoked by a 'http4' component in the second route to update the search engine index data). Manageability: you can take advantage of Apache Camel monitoring tool such as Hawtio. You can monitor the process, pause, stop and start a route, for instance. You can build and install the module first with Maven. Now you can build and run the demo project from the submodule 'demo' with Maven and run the demo applications locally with Maven Cargo Plugin (Apache Tomcat embedded).